Excel 3D Formulas. Excel Tips from kalmstrom.com Business Solutions. The possibility to tell Excel to calculate is a crucial feature and the most important reason to use it. In the demo below Peter Kalmstrom explains how you can manipulate several worksheets simultaneously. A 3-D reference refers to the same cell or range on multiple Excel sheets. It is useful when you work with several sheets that follow the same pattern and when cells on each sheet contain the same type of data. 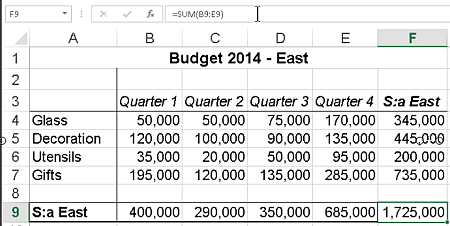 In this tutorial Peter uses budget data from different departments of an organization. Each department has its own tab in the Excel workbook, but by using 3D references he can set auto-sums for all sheets in one process. Peter also creates a new worksheet for the whole company. Using 3D referencens he can vey quickly get them sums for all the departments into it. Peter uses Excel 2013 for his demo, but 3D references works for earlier versions of Excel too.